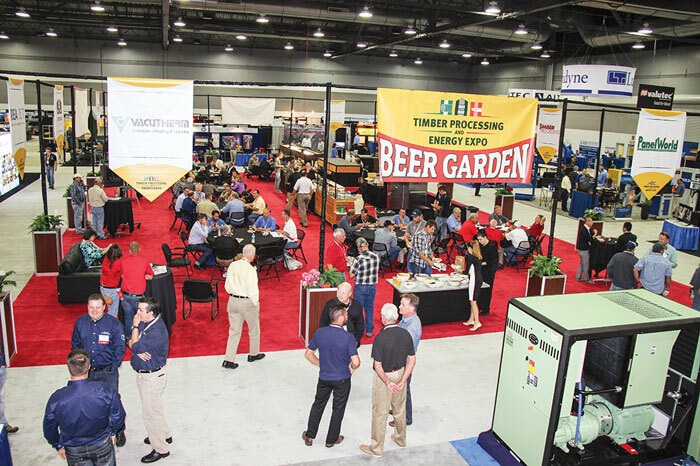 About 1,600 industry (non-exhibitor) personnel, representing 110 forest products producer companies and hundreds of individual mill site operations, attended the third Timber Processing & Energy Expo held September 28-30 at the Portland Exposition Center. The event, produced by Hatton-Brown Expositions, LLC—an affiliate of Hatton-Brown Publishers, Inc., Timber Processing and Panel World magazines—caters to primary producers of lumber, veneer-plywood and engineered wood products. “Attendance from the mills was up about 10% from 2014, which we thought was solid considering the number of mill closures and consolidations in the Northwest during the past two years,” comments Show Director Rich Donnell. 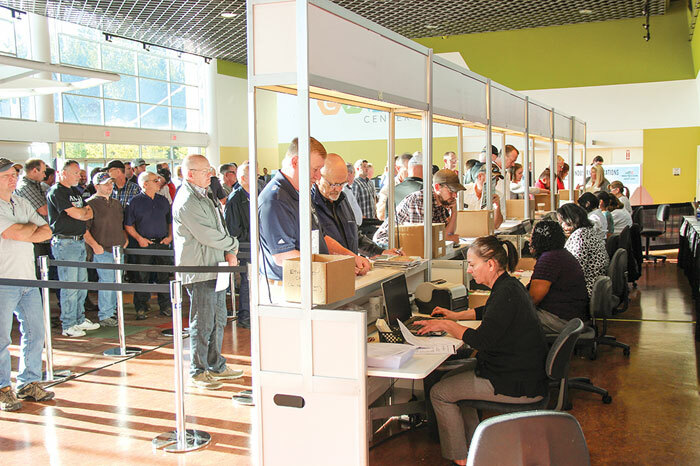 Attendees from 39 U.S. states, six Canadian provinces, and 20 countries besides the U.S. and Canada came to view 225 exhibiting companies on 60,000 sq. ft. of booth space. The technology was everywhere and more big machinery was showcased than in previous events. It also included for the first time German and Italian pavilions featuring exhibitors from those countries. Former Timber Processing Man of the Year, Jim Quinn, now Chairman of the Board and acting CEO of White Mountain Apache Timber Co. in Arizona, was making the rounds. “The White Mountain Apache Timber Company is pretty far behind on technology and basically we need to replace our small log mill and include mechanical sorting on the next one. We also need a sorter for the Stetson Ross planer and we may want to do some mechanization in the log yard,” Quinn says. Quinn notes that the Tribe has more than 700,000 acres of very nice ponderosa pine. They currently operate a double cut headrig and a single cut headrig in the large log mill, and an aging double length infeed system in the small log mill. The mill operates two planer lines. Many forest products companies and mills encouraged mill management and operators to attend TP&EE. Weyerhaeuser had 98 in attendance; Sierra-Pacific Industries, 66; Hampton, 46. Stimson Lumber, Alta Forest Products, Seneca, Idaho Forest Group, Roseburg and several other companies also sent large contingents. Mike Pederson, president and CEO of Alta Forest Products, which operates several sawmills in the Northwest, said they attended for two reasons. One was to meet with an exhibitor to review the latest upgrades in automated planer grading. “But the main reason, and the reason for so many of our people there, is that I like to get our people away from the plant to see what is new and innovative within our industry. The show in Portland is a great venue for that,” Pederson says. Most exhibitors found that most attendees were upbeat and had investments in mind. Several machines had “sold” signs on them, such as a Gilbert planer going to Seneca Sawmill, a Samuel packaging system to Sierra-Pacific and a Corley carriage to Canfor-Beadles. JoeScan introduced a six-laser, high-density carriage scanner, the JS-25 X6B. MDI emphasized its TWA-2000-HD system that is used for scanning whole logs and received a lot of interest in this system from customers and distributors, as well as positive feedback from customers who are already running it in their sawmills. Microtec set up its Goldeneye 900 multisensor board scanner and Springer screw feeder as well as a miniature of the E-Cut board trimmer. USNR attracted considerable attention with its large booth that featured four vertically standing pieces of cross-laminated timber, each with one of the U-S-N-R letters sawn out. The company also emphasized its all-electric lumber handling equipment, displaying the ElectraTong Lug Loader and the Multi-Track Fence, of which more than 100 have sold since its inception several years ago. A CamShift 600 Cambio debarker, new to the North American market, was also on display. The system combines debarking and flare reducing in a single, modular machine. USNR also hosted a popular tent eatery in front of the expo hall. Andritz showed its new powerheads (solid canter heads for primary and secondary canters) and its new Drum Style Chip-N-Saw heads for four-sided canters and profiler machines, as well as its new Turnknife System 4 for sawmill chippers. BID Group and its range of companies presented three new products, including the Miller planer, McGehee profiling machine and the new generation of GradExpert. Levesque says there was very high-quality people in attendance and many of those people were looking for short- and mid-term investments, upgrading their mill and operations to keep up the pace with the market. One of BID Group’s newer members, Ron McGehee, also spoke during the Lumber Manufacturing Workshop held on the second day of the show. 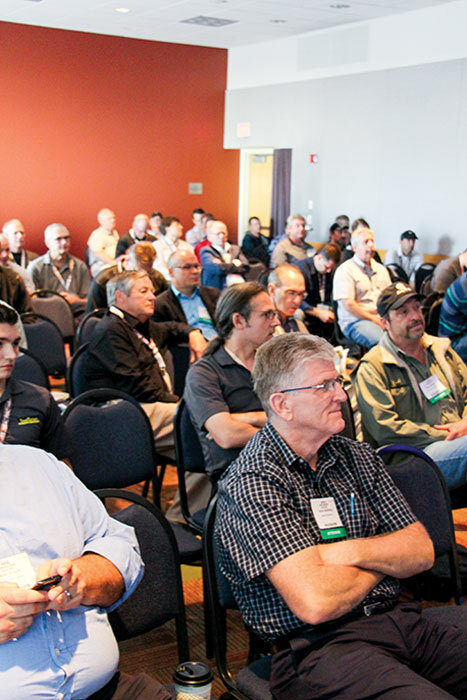 McGehee’s talk on The Latest Profiling Technologies was one of 17 presentations during the Lumber Manufacturing Workshop, which had simultaneous sessions going on in adjacent rooms. Two-hundred people attended the workshops, bouncing from one room to the other, though most of them gathered for McGehee’s presentation. McGehee noted early in his talk that the objective of his profiling system is to improve productivity and recovery and reduce manufacturing costs. He pointed to a reduction of costs of $25/MBF in recent projects, an increase in production up to 25% and an increase in recovery of up to 3% in some mills. He said the installation of the profiler means production is not limited by the edger anymore (up to 60% less boards going to the edger); most of the products from the gang are finished, and there’s less downtime. Profiling on a solid piece of wood like a cant at slower speed (600 FPM max) showed with time that edging accuracy is better than an edger going at 1200 FPM, McGehee stated. A typical payback on the profiler in a 150MMBF mill is just under eight months, he added. 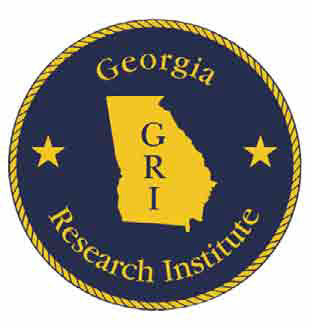 McGehee said there are two typical arrangements: as a standard profiler, for gangs fed by belt conveyor by centering chain systems; and as an infeed profiler, for gangs fed by a centering chain system and where space is limited, with the unit replacing the existing curve-saw infeed module. The profiler includes disc chipping heads for the surface finish, independent profiling heads with infinite positioning, and skew and slew movement. Yvan Rainville, vice-president sales and marketing for Autolog, addressed the company’s new modular scanner frame and also split & shake detection at the trimmer optimizer, using 3D identification. He cited a case study at Tolko Lakeview on a 20 ft. trimmer optimizer with a “conservative payback of salvaged volume of approximately $168,000/year,” and additional savings of $6,000 in drying costs, as well as increased performance at the planer, reduced blockage in downstream sorter and stacker, and improved sorting of high grade products at the sawmill. He also addressed Autolog’s unsound wood detection system, pointing to positive results at Forex on a 16 ft. trimmer optimizer with annual savings of $108,000 for a production of about 100MMBF. Benefits included reduced handling inside and outside the sawmill and increased chip quality, with savings of approximately $6,000 per year due to staying within chip value norm, $36,000 a year due to increased kiln capacity and decreased handling, and $66,000 annually due to increased planer capacity and decreased handling. Michel Loyet, CEO of Finega Group of France, presented the company’s new MasterTwin 3D end dogging log breakdown system. Prior to the cutting line, each log is scanned by a 360° rotary scanner which scans the full shape of the log during the cutting sequence of the previous log. An optimizer calculates the best sawing axis and cutting pattern in the 3D space based on mill production and value parameters. Ellen Nelson, chief financial officer of Lucidyne, and Ryan Shear, lead optimization engineer, spoke on their GradeScan planer mill grader and said customers start seeing ROI in less than eight months while improving the consistency and overall quality of lumber. They noted that its compact lineal design means that most mills make very few changes to their existing line, and installs in just two weekends with little or no downtime. They also addressed the GradeScan True-Q lumber tracking system, and warp detection. They emphasized the GradeScan’s tracheid sensor and T3 sensor. “If you can’t see knots behind blue stain, you don’t have a Lucidyne GradeScan,” Nelson said. 2016 TP&EE Registration Is Open!